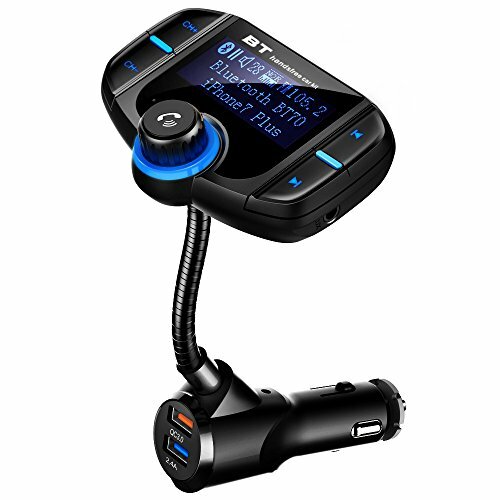 The easiest way to to add Bluetooth function to your car stereo system, the fastest charger to fulfill your power-hungry phones in vehicle. First, use Google to find the best empty radio stations near where you live. Set your car radio station to an empty channel that Google recommended, then choose the same channel on the transmitter. Second, turn on the Bluetooth of your phone, search "BT70" and pair. Once it shows connected on the screen, the transmitter is ready to go. * Stable Bluetooth and FM connection: Stream the music on the go. * MP3 Player: Play the music list in your TF card. * Aux Input: Connect it by the included 3.5mm audio cable to enjoy your music. * Dual USB Car Charger: Qualcomm Quick Charge 3.0 USB & Smart 2.4A USB deliver high-speed charging for driver and passenger. * Hands-free Calling: Give you a safer driving experience, support answer/ hang off/reject/redial calls. * On/Off Switch: Turn off the screen and connection, reduce the wear and tear. * Adjustable Goose Neck: Help you move toward or away from something. * Universal Compatibility: Optimized charging for Apple and Android devices such as iPhone 8 X 7 Plus 6S 5S Samsung Galaxy S8 Plus S7 edge S6 Motorola Sony etc. * Indicator Light: The soft blue light help you find it easily in dark. * 1.7" Large Screen & Button: Easy to operate, support skip/pause/play songs, turn up/down the volume.